The industry’s most coveted award honors the best new gear and essentials for outdoor enthusiasts. With the introduction of the DROP line, Kestrel sought to expand the environments that could be measured and the reach and usability of the data. 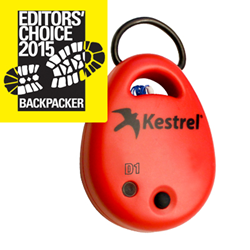 Kestrel is proud to be named as a Backpacker Editors’ Choice Award recipient. Since their inception, the Backpacker Editors’ Choice Awards have come to be regarded as the most sought-after award for outdoor equipment and apparel found in the industry. All winners must excel under extensive field-testing conducted by Backpacker’s team of editors, who take hundreds of products into the backcountry to put them to the test. This rigorous process ensures that the performance of the winners is truly worthy of distinction and meets the guiding principle behind the program: gear that is of real value to the readers of Backpacker magazine, who are active, long-term outdoor enthusiasts. The Kestrel Weather & Environmental Meters line includes dozens of products to monitor, record and log weather & environmental data and enable users to “know their conditions.” Kestrel meters and loggers are manufactured by Nielsen-Kellerman (NK), which has been building technically advanced environmental instruments for close to 20 years. Kestrel products are employed by thousands of users to keep them safe and informed as they work and play. Every Kestrel meter offers patented features and is rugged, accurate, waterproof, easy-to-use and backed by an industry-leading five-year warranty as well as designed, developed, built, tested and supported entirely in the USA. NK is proud to be both a recognized leader in lean manufacturing and process improvement and an award-winning top workplace. NOTE: Kestrel Connect for iOS is available for free download from the App store. Android support coming soon. Bluetooth® Smart requires recent generation smart phones or tablets. For more information, contact Carrie Capili at 610.447.1555 x219, ccapili@nkhome.com or visit http://www.nkhome.com.